Andy Wicks Paints Blog | London based artist interested in ambiguous and decaying structures found within the urban environment. The Doldrums is the first gallery solo exhibition by Andy Wicks, the culmination of an intense residency within the gallery space over the summer. For this show Wicks has produced a new body of site responsive work that investigates Deptford and its historic links to the river. Moving away from a studio-based practice, his time in residence offered a unique opportunity to unite a site of interest with a place of making and display. Wicks describes himself as an “urban walker”; learning about a place by walking, repetition and absorbing the sites, smells and characters that inhabit it. He has taken on the role of the collector; a collector of knowledge, detritus, stories and data. Conceived through a period of heavy research and extensive readings, The Doldrums explores the remnants of the industrial past and its effect on the area today through sculpture, photography and performative expedition. The Doldrums opens Friday 30th August 6-9pm and continues until 28th September. It’s the 6th week of Andy’s residency at Occupy My Time Gallery on the Enclave block in Deptford; after a fair bit of walking, plenty of reading, lots of sanding, and a few visits to Little Nan’s bar.. a jetty has appeared in the gallery! Its all very exciting, I’m able to walk the length of the gallery on the indoor jetty to my Interning den, I’m already excited about the fun I’ll have invigilating on a Saturday. Andy: It’s taken 11 days to build which involved a lot of sanding and cutting but its been enjoyable to work on and I’m pleased with how its looking. I didn’t start making until the 5th week of the residency so its felt good to finally get stuck into some physical work. It’s been funny to watch people’s reactions from the window change now there’s a crazed man in the gallery singing and dancing with an electric sander. I think my relaxed approach and joking about not having enough time at the beginning meant a lot of people may have doubted my intentions. So did you have this idea from the beginning? Andy: I knew I wanted to do something different from my usual studio practice and installation was definitely something I liked the idea of. How were the first few weeks of the residency then for you? When you come to a new place it always takes a while to settle in and to become adjusted to the space so its hard to start making work straight away. I spent a good month just reading and exploring Deptford as I wanted my research play a large part in informing the work I made. Leaving it until week 5 to start making did create a bit of pressure, but I think I worked well under it – and I’m pretty happy with the outcome. 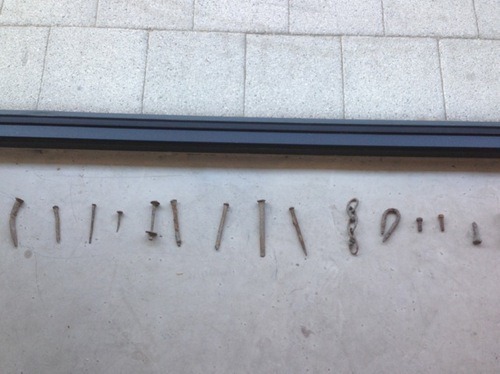 So on creating the jetty inside the gallery space, how did that work extracting it as a form. Did you make sketches, or paintings to accompany it? In terms of form its just an approximation to give a nod to such structures without being a pastiche. The dimensions are shrunk down to work within the gallery space as an intervention while acting as a platform from which to take in the rest of the exhibition. I’ve looked at Thames mooring structures (Dolphins) in my paintings so it’s a form I’m familiar with. So through creating it in the gallery, do you want the audience to just take the essence of the jetty or really interact with it, almost like a play piece that it seems to suggest? The piece is intended to be used by the viewer, offering a path through the gallery while also elevating them above it. The Jetty could be seen to represent the journeys I’ve made in and around Deptford, taking this idea of movement and direction into the gallery space. What other work are you planning to show with the jetty? It’ll be accompanied by at least two other works, one will be photographic, and the other documentation of a walk and gesture I’m planning. I’m still not sure how the latter will be realised in the exhibition as I see the walk itself as the work but I will be charting my movements and capturing images of the act. Have you found any particular stage of the residency more or less enjoyable? The making or the research for example? No it’s all been equally enjoyable, I’ve realised that in the past I’ve not always spent enough time getting into my research, so its helped me revaluate certain things. Do you think the experience has reinvented your practice? I came into the residency knowing that I wanted to do something different. I was confident of being able to deliver technically however I was conscious that it wasn’t simple about the residency and exhibition, but rather a chance to shift my practice and possibilities. Its too soon to say what this time will do for me in the future but I’m pleased with how I chosen to use it. Do you feel having a show that focuses on a specific place like Deptford and being situated next to a host of galleries at Enclave has given you a duty to make work of a certain type or style? There’s definitely an intensity that comes from creating the work in the same place i’m exploring, I wouldn’t say being around the other galleries has influenced the work I’ve made but it has opened me up to differing uses of the space. The sense of community has added to the experience and I’ve enjoyed having dialogue with the others at Enclave. What do you hope people will take out of the exhibition? Is there a play element? I would like the viewer to engage with the exhibition and individual works and if there’s something in particular that captures them, then there is a lot more reading and investigating they can do. People tend to choose where to live based on transport links and affordability, while not necessarily being aware of whats on their doorstep. In the relatively short time I’ve been in Deptford I’ve picked up so much and have become very fond of the area. The Jetty could be seen as playful, its an interactive piece which people are encourage to ‘use’. The Setting has changed quite a bit in Occupy My Time gallery this month. July and August sees artist Andy Wicks take up residency in the space with an investigation into the atmosphere and visuals surrounding Deptford and the river. The gallery which now appears transformed into a ‘pad’ featuring a cool white lounger sofa and a super selection of books and maps is an exciting change for the summer, and will be fully exposed to the public from the gallery’s large front window, which Andy has already started to scrawl over: Andy’s investigation is made primarily by foot, embracing a natural and very first handed experience of his artistic material. He is jotting on the glass the areas he is covering by foot each day along with places of interest, tidal times, wind speed and wind direction. E: Will this become part of your final piece? Its actually very interesting data to have plastered so big. 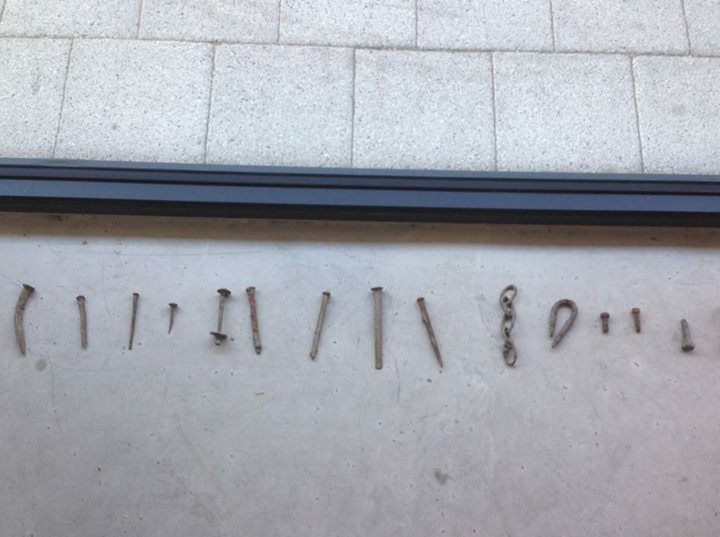 A: I knew I’d be using the gallery primarily as a research space, at least to begin with, so I decided to utilise the large window as a visual journal of my travels. Even if there was nothing specifically being made in the gallery, there was this evolving data stream, a sign of life from within and a hint at my investigation. I’ve yet to decide whether it’ll remain for the exhibition, I imagine I’ll see how it looks once the show is installed. E: Do you have a plan for your residency, what mediums can we expect to see you work in? A: I have a loose plan but have purposely tried not to tie myself down too much, instead letting the experience of being in and around the gallery to direct me. Deptford as an area really fascinates me and contains many of my interests and concerns surrounding history, urban planning, the maritime. So right now I’m doing a lot of walking and reading to absorb as much as I can. Leading into the residency I’ve been feeling rather restricted by my painting practice which has been my predominant medium since graduating, so I decided that whatever happens, I’d leave my paints behind. I really want the concept to drive the work that I make here, whether it be: Sculpture, photography, video, installation – it could be all of them. E: Do you feel pressured by a residency when starting to make work, the fact you have a set period of time and a public awareness of your development within the space? A: Not at all, I think it should be an enjoyable time. The only other residency I’ve done was for 12 months so its definitely different having to settle in a space and deliver an exhibition in less than 2 months, but it’s a good sort of pressure. I see the residency as a chance to get out of my regular routine and delve into a different geographic and mental space. E: Why a residency in Deptford? Have you had a previous interest in the area? A: I was invited to do the residency here I suppose because I have always had a fascination with the Thames that comes through in my work. I don’t know Deptford that well yet, but it’s a place that is really rich in History and offers great exposure to the Thames. What is interesting is that I’m from Bromley, in the suburbs of South London and the river Ravensbourne that starts its journey in Caesar’s Well in Keston which is a mile or so from where I was born and grew up as a kid; Actually runs through an area I know very well towards Lewisham, and Deptford right into the Creek. So I feel I’ve got a direct connection to this spot. E: Is the river’s journey something you’re interested in then? A: Yes, I suppose I’m here looking for beginnings and ways into the area which could form the basis of my investigation. I definitely find movement and navigation of interest; I walk a lot which started I suppose as a sort of quiet rebellion against the cost of transport and congestion which the Olympics were rumoured to cause where I live in East London. I walk to travel as well as for pleasure and can easily walk 10 miles a day without really questioning it. E: One of your readings has been ‘Wanderlust: A History of Walking’? A: It’s really fascinating to see how historically walking has played such a big part in the development of creative ideas. Rebecca Solnit, the author describes how some of our most influential writers and philosophers walked as a way of thinking which has resulted in the creation of some of their brightest thoughts. There is a theory that the speed of thought it about 3 – 4mph equivalent to walking pace, so walking is a good space for thinking, whereas say speeding through a landscape by train with scenery flying past requires taking in too much information and doesn’t help the mind focus. E: Its very early days in your residency, but what has interested you so far? 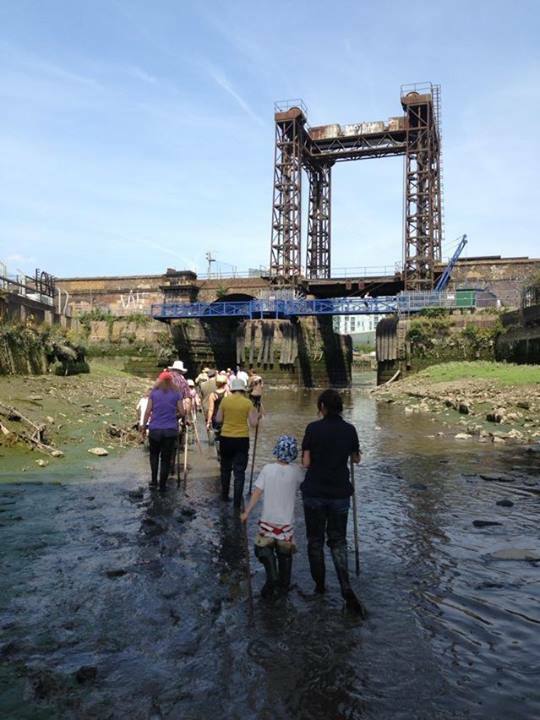 A: I went on a low tide walk along Deptford Creek and the amount of stuff that gets chucked in the river is crazy, it was fascinating to walk along the muddy riverbed which 6 hours later would be covered by 6 or 7 metres of water. What was really interesting, was that they did a fish count in the creek before and after cleaning which saw the removal of 300 shopping trolleys that had been dumped there. 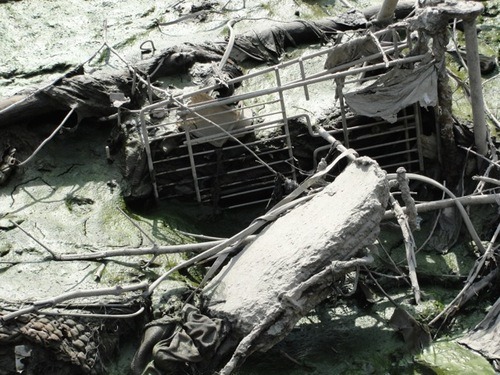 What they discover was that the number of fish actually halved with the removal of the shopping trolleys. The trolleys were acting as a substitute for reedbeds which guard the small fish from the larger predators which came in with the tide. Its amazing how nature can adapt and actually thrive in urban settings. *Urban reedbeds, eg. Deptford Shopping trolleys! For the past few weeks I have been in residence at OMT Gallery where I have been researching and working towards a solo show in the space opening 30th August. Attached are some images from my time so far in the area. Throughout July and August Andy Wicks will be in residence at Occupy My Time Gallery, part of Enclave a new collective of project spaces on Resolution Way, Deptford. Known for his painting practice which looks to the post industrial riverside of the Thames, Wicks arrives in Deptford with a hunger to submerge himself in its rich and varied past and strong community. Moving away from a purely studio based practice, Wicks sees this as an opportunity to work in a site responsive manner, uniting an area of interest with his place of making. This union questions certain working habits developed over the years, offering a chance to investigate his new surroundings and how to respond to a self imposed change in circumstance. Wicks’ investigation is often triggered by the written word, wide readings on subjects are then followed by a desire to experience first hand. In the case of his paintings of mooring structures the linear nature of the Thames set a challenge and physical duration to the project. Arriving in Deptford with just a sofa, selection of books and a want to absorb all he could on the area. Wicks spent time getting to know his new neighbourhood on foot, tracing his movements and recording his discoveries as he moved through it. He describes himself as an urban walker, learning about a place by walking and repetition, absorbing the sites, smells and characters that inhabit it. He has taken on the role of the collector; a collector of knowledge, detritus, images and data. 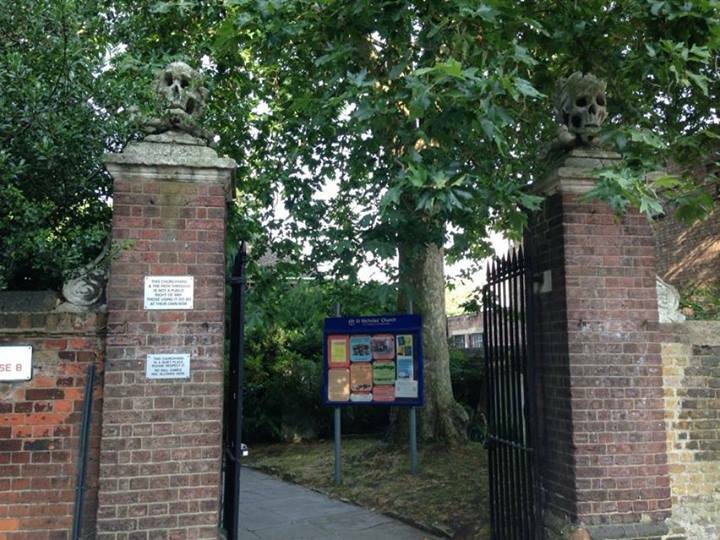 By combining these discoveries and a heavily researched study of Deptford’s history we gain an insight into Wicks’ investigation and a hint to the work which will result from his time in residence. January and February saw lots of experimentation with paper in the studio. Here are a selection of oil on photographic works which have taken a series of disused photographs and a combination of positive and negative spaces from previous source material to create small studies. Prophetic Diagrams reopens at George and Jorgen after the winter break and has been extended till Saturday 16th February. The large survey exhibition of drawing/ diagrammatic mark making features artist from UK and New York including a number of established artists often showing rare lesser known/ preparatory works. One of my Plane Sight diptychs features alongside works by Sarah Lucas and Dan Perfect, a piece I felt was made for the show when I read the brief. I’ve been following George and Jorgen for since they opened at the end of 2010 and have been introduced to some great artists through their program, personal favourites include – Peter Ainsworth, Martin Newth and Tom Pope who have each had stand out solo shows with the gallery in past 2 years. I highly recommend you take the time to see this diverse and rich exhibition while you have the chance. George and Jorgen sits just off Bermondsey Street (a short walk from London Bridge) and next door to the new White Cube space. Chris Baker, Mike Ballou, Nathaniel Mellors and Chris Bloor, William Corwin, Rose Davey, Julius Doehner, Claire Dorsett ,Clara Fialho, Paddy Gould and Roxy Topia, Noah Landfield, Ronnie Landfield, Sarah Lucas, Paulina Michnowska, Roxy Paine, Simon Patterson, Bruce Pearson, Joyce Pensato, Elise Co and Nik Pashenkov, Dan Perfect, James Pimperton, Nathalie Provosty, Fiona Rae, Nick Roberts, Bob and Roberta Smith, Ellen Stanford, Carin Riley, Gaetan Sigonney, Sandi Slone, Lucy Skaer, Pinky Tesfay, James Trimmer, Jessica Voorsanger, Tom Webb, Andy Wicks, Holly Zausner. William Corwin’s essay for the exhibition is inspired by the illustrations in an 18th century book of black magic that he discovered in a dumpster in Greenwich Village in 1993. Assembling a diverse group of established and emerging artists from the UK and New York, he invited them to respond to his essay. The artists then created or chose a piece from their own collection to put in the show. Last Friday I turned up with a work on paper in hand for First Come First Served at the Lion and Lamb, a new gallery set within a pub in Hoxton run by Peter Jones of Turps Banana Magazine. In spite of the open nature of the exhibition it was interesting to see the calibre of artists who turned up with works, perhaps down to the niche while connected Painters on Painters approach of both the Lion and Lamb and Turps Banana. 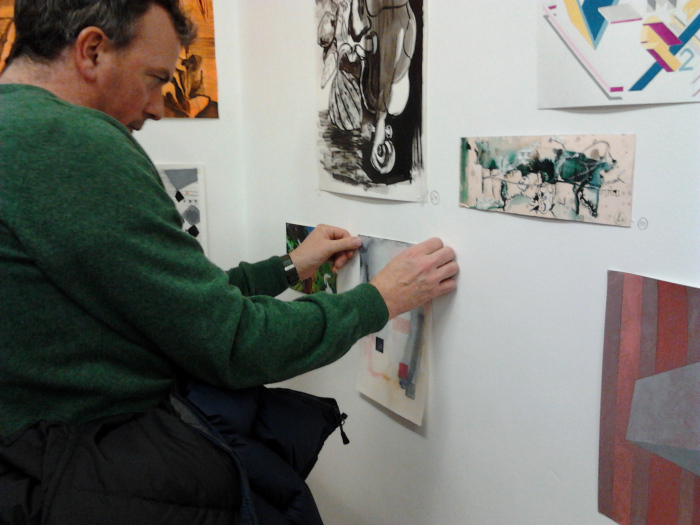 Artists were invited to arrive with a work on paper under 70 x 70 cm and ‘install’ with the supplied blu tack. 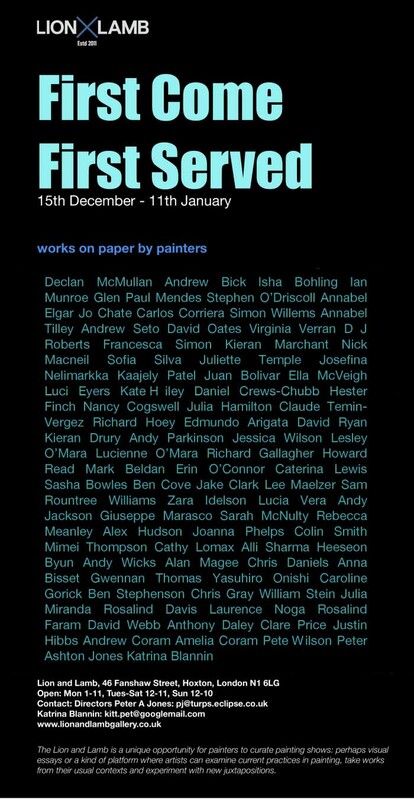 Click here to read Andy Parkinson’s write up of the show on his blog which features his thoughts on my piece Mudlarks. The show continues until 11th January and being a working pub can be viewed 7 days a week until late. I’m delighted to announce that I have now joined the board of Trustees at the Florence Trust as Artist Trustee. Having gone through the program in 2010 – 2011 its a great honour to be asked back to play a part in the future of the Trust. I feel my time at the FT was a turning point in my practice, where my work developed considerably and I left with the confidence from the experience to continue onwards. This was down to a mix of the stunning St Saviours environment, a strong and close knit group of fellow artists and the time to push forward my practice. For this reason I was always willing to give something back, as it happens this role enables me be involved in the program in a more official capacity. As a former residency artists I will act a link between the current studio artists and the board of Trustees, I will also be working on setting up the Alumni group to make the most of the large network of artists who have been through the residency. I have been working on the social media side of things, an area the Trust has so far resisted entering. We now have a dedicated Facebook page and Twitter account as well as a blog. These will be used to share information on the activities of the current studio artists both in and outside of the studios as well as alumni exhibitions. There are many great stories of Florence Trust artist’s successes and I hope that through these new strands of communication we’ll be able to share them, in turn promoting a fantastic arts charity who 20 years in are still growing and helping artists from around the world develop their practices. I’m looking forward to using this role as an excuse to visit the studios more often, getting to know all the artists and have a hand in the future of the program. Friday sees the launch of the 20th edition of Petite enveloppe urbaine at Banner Repeater, which is based on the theme of Game. I met organizer (or Coach) Douglas Scholes while he was on SPACE studios Canadian artist in residence program in London, as 1/5th of artists collective Centre de recherche urbaine de Montréal (CRUM) he invited a number of artists he met during his time in London to participate. ‘Game’ for me spoke of childhood pleasures and timeless boys pursuits which the romantic inside would like to think can still exist in childhoods dominated by the digital. The piece I created takes a Victorian etching of boys mudlarking on the banks of the Thames as a starting point, which I made as a lino and printed over a digital print of a WW2 propaganda image of the Royal airforce flying over a naval convoy. I wanted to make an image which transcended the centuries to show the ageless nature of boys games and messing around in mud, while the war time background image (war games?) possibly featuring boys of a not dissimilar age heading off to war on ships. 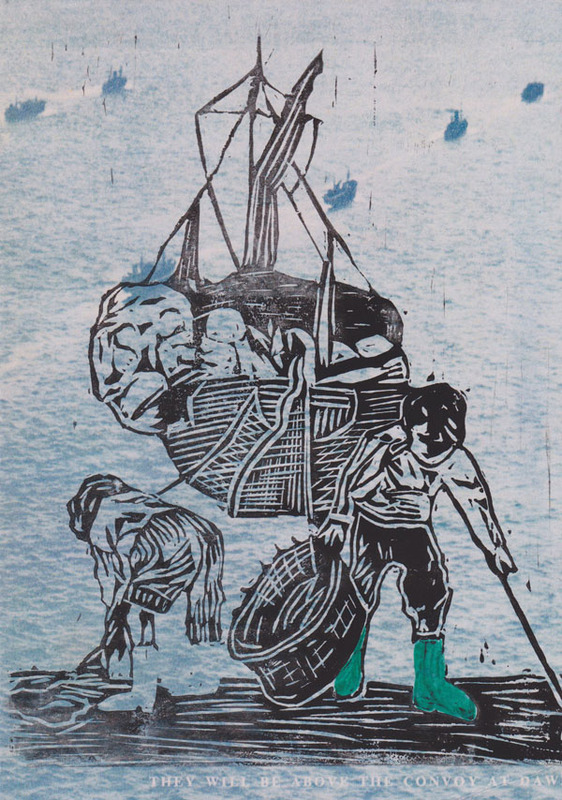 The figures of the original etching are now wearing Wellington boots, a subtle nod to the shift of era. Petite enveloppe urbaine no. 20 is a serial artists’ publication organized through the Centre de recherche urbaine de Montréal (CRUM) that uses standard sized postal envelopes (A5) to distribute ideas across cultural networks. The edition for this issue is 70 for which the invited participants were asked to produce a work based on the theme GAME. The eleven participants include Daniel Canty & Patrick Beaulieu (Montreal, Canada), collectif_ fact – Annelore Schneider & Claude Piguet (Geneva, Switzerland), Emotional Driven Process Based Parallel Identities (London, UK), Levin Haegele (London, UK), Lukas Heistinger (Vienna, Austria), Pekko Koskinen (Helsinki, Finland), Alan Magee (London, UK), James Prevett (London, UK), NaoKo TakaHashi (London, UK), Andy Wicks (London, UK) and YKON (Helsinki, Finland). Centre de recherche urbaine de Montréal (CRUM) is a symbiotic (parasitic) research group with no exhibiton space of its own. It uses the pre-existing exhibtion network to present diverse projects. The CRUM is an artists collective of five members dedicated to exploring links between art and urban space. Friday also sees the launch of The condition of things, a book documenting Douglas Scholes’ project of the same name that was developed during his residency at SPACE Studios, Hackney, UK (March to August 2012). The one night only launch is at Banner Repeater on Friday 16 November 2012 from 7 – 9pm, I’ll release details soon of how you can get hold of the publication/print portfolio.